Every trader faces the challenge of identifying potential trading opportunities. With thousands of stocks to choose from, researching each one can be overwhelming. In this webinar we will narrow down the universe of choices into a manageable number, consider using technical analysis tools as filters. Taking the time to learn how to use the Technical Analyis to filter stocks effectively may be one of the most profitable decisions you will ever make! The main objective of this webinar is predicting stock price movement based on market trend, past price performance and volume of the stock. 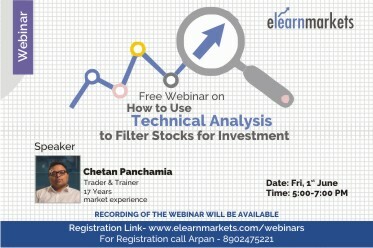 It's a Free Comprehensive Stock Research session using standard Technical Analysis supplemented with Charts & state of the art stock screener and pattern finders to help traders/Investor to choose stock using their favorite pattern, technical indicator, financial parameter. The participants will learn how to use technical tools, charts, patterns, stock screener to filter instruments. They will learn to apply this indicator for stocks to know if the stocks can be a big winner. They will learn to identify & evaluate potential trade opportunities using technical analysis tools. Chetan ji well articulated as usual. Keep up the good work team. I really enjoyed the webinar chetan sir explained very nicely really very valuable for me !!!!!! always want to join these types of webinars and special thanks to stockedge !!!!!!!!! Chetan Panchamia is good at options . Elearnmarkets can arrange webinars on options. Pls note the last 2 webinars on volatile strategy on options (one paid and next follow up free) were not ok.
Elearnmarkets can also arrange boot camps at Chennai by Mr. Chetan without spending much on logistics. The webinar was very good and was an easily understandable way. Anything related to daily options strategy will be useful for me.